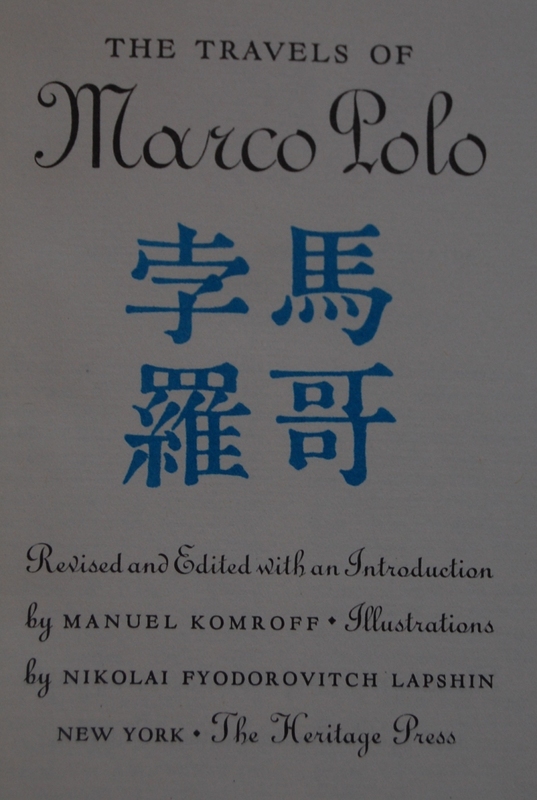 Reprint of LEC #56, 5th Series, V. 8, in 1934 in 2 volumes. 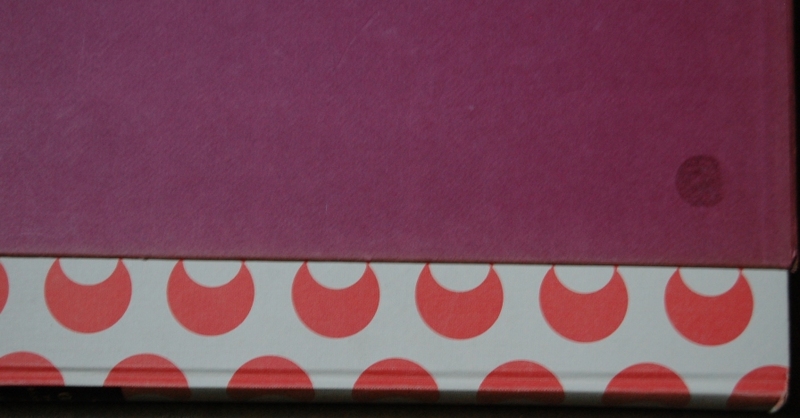 Front Binding – It’s been a little while since I gushed openly about a Heritage edition. Typically, the Limited Editions Club is where the truly stellar and remarkable books come from, with the Heritage re-releases, while still quite nice and attractive, are usually not of the same pedigree as their LEC cousins. 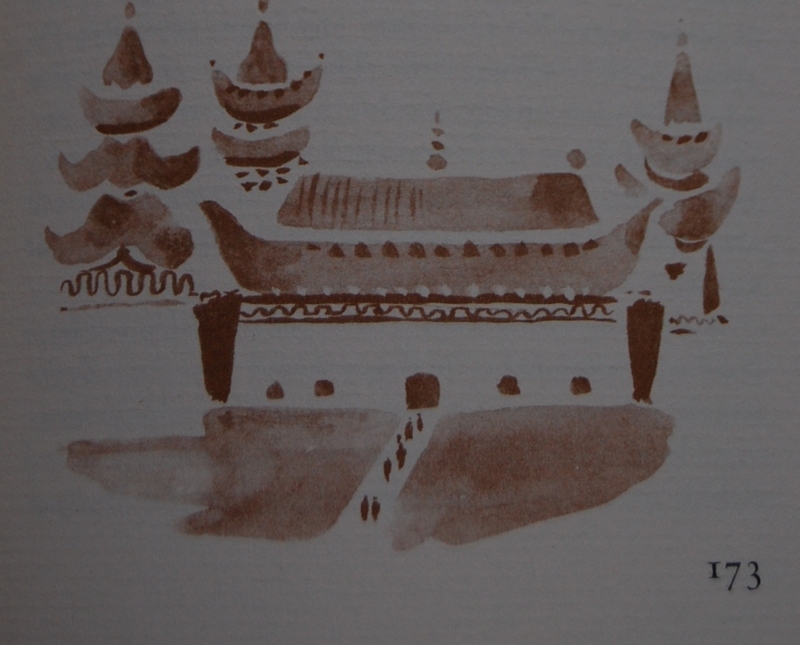 Here, however, I will argue that this early Heritage printing of Marco Polo’s Travels is indeed the grander of the two printing houses. 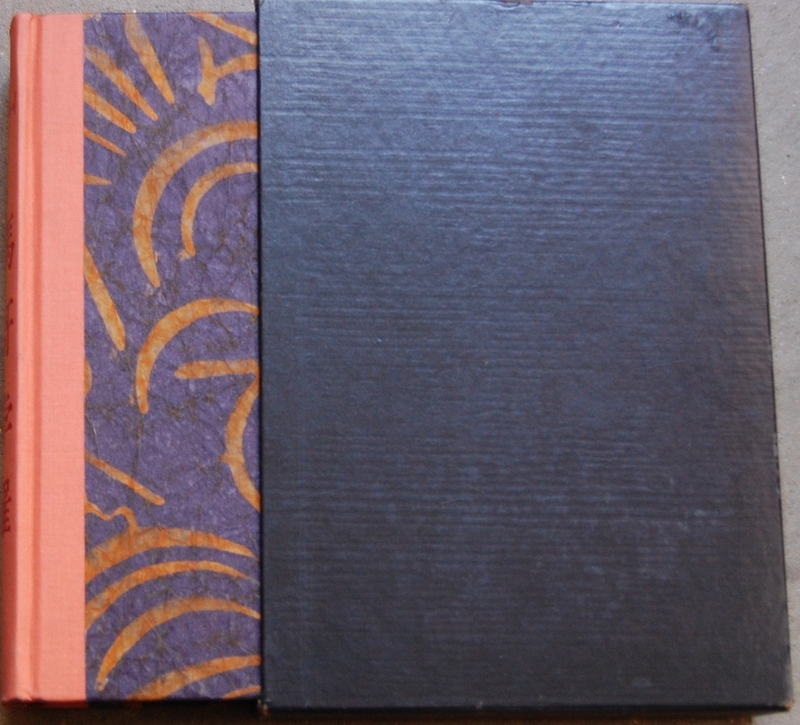 I LOVE the exquisite and appropriate binding; a luscious blending of purple and orange colors on what feels like rice paper (I lack a Sandglass, so I’m making generalizations). The bold choice of an orange spine with red text further makes this a stand-out. The LEC edition, in contrast, is covered in black cloth with a rather simple, elegant design that lacks the dynamism of this version. Anyway, this amazing little book has some story to go behind it. You see, this is the winner of the very first Limited Editions Club illustration contest! Macy, Carl Purington Rollins and Frederic Warde served as judges, and after reviewing over 400 individual entries for 30 different titles requested by members, Nikolai Fyodorovitch Lapshin walked away with the $2500 prize and the right to have his brushed illustrations grace the Club’s edition of Marco Polo. 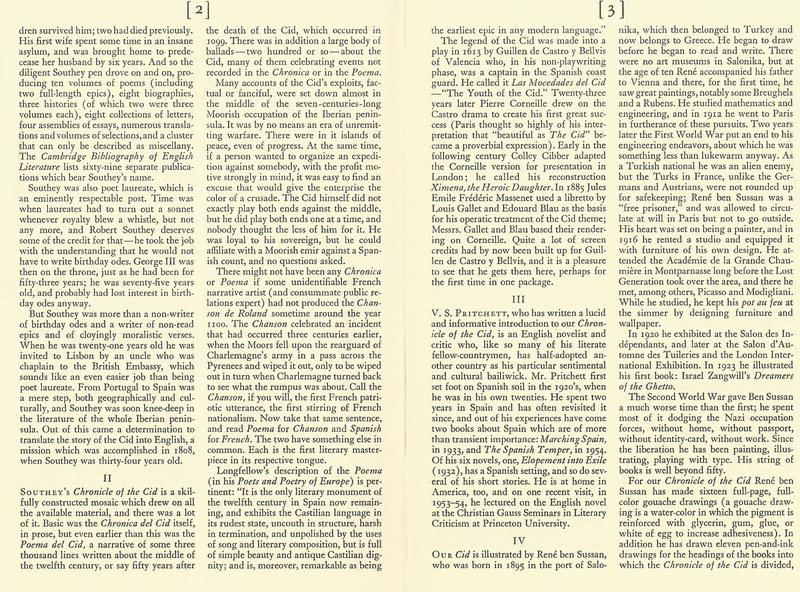 This was the only time Polo’s journals were committed to print by the George Macy Company, and Lapshin only reappeared in the Macy canon to illustrate one of the many LEC Shakespeare titles, Titus Andronicus. 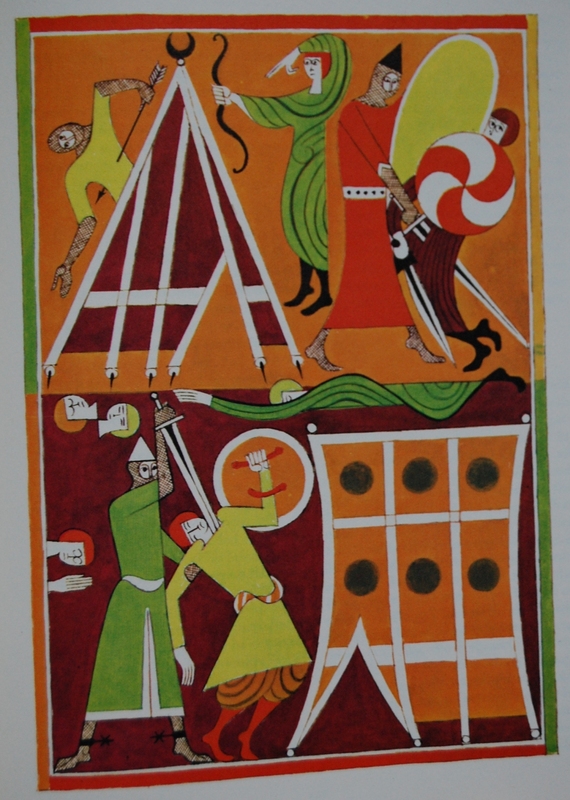 Lapshin was a professor in graphic arts for Stalin University, and while he had never illustrated for books before, Macy felt he did a smashing job with his debut. He and the other judges felt that his work felt like it belonged to a book, and that it belonged to Polo’s remarkable travels. I happen to agree, in case my initial paragraph was not clear in how much I adore this book. 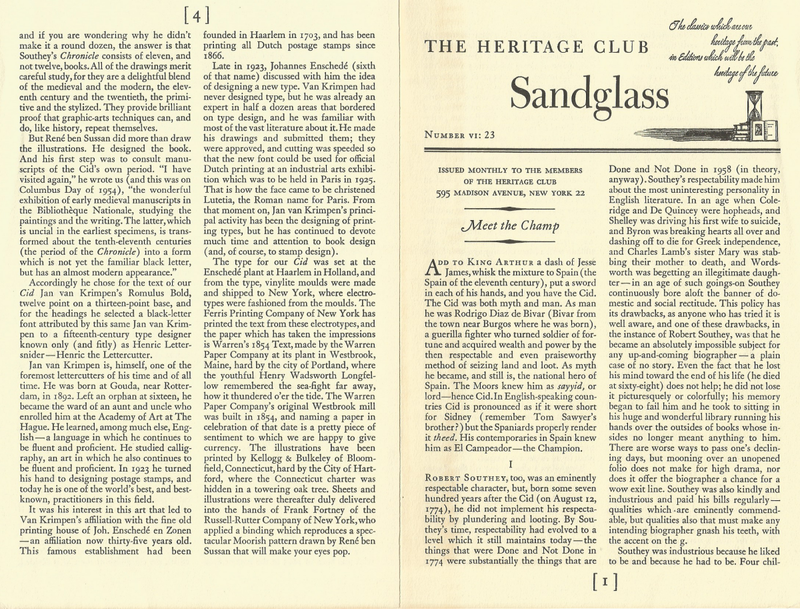 I don’t have this HP edition but perhaps you would like to include this from Michael Bussacco’s Sandglass Companion, Sandglass 10N, March 1950. The paper is from the Hamilton Paper Mill; the pages were reproduced (via photolithograpy) from copies of the original LEC, by the Duenewald Printing Corporation. For the binding we arranged for a special making of linen, in a soft finish, to be done for us by the Western Shade Cloth Company…done in a “Chinese Orange” color….for the boards which cover the sides, we purchased a most-unusual, made-by-hand, obviously made-before-the-war, Oriental lamp-shade covering material of an unusual tensile strength and eye-filling Oriental colorings. You are very close in surmising it is rice paper, Jerry; I’m sure it is probably mulberry paper, which feels a lot like rice paper, but is much stronger, also used to make tapa cloth. My mother had lampshades when I was a child that had very similar paper to the illustration on your site. I have a few sheets I intend to use someday to rebind one of my books. 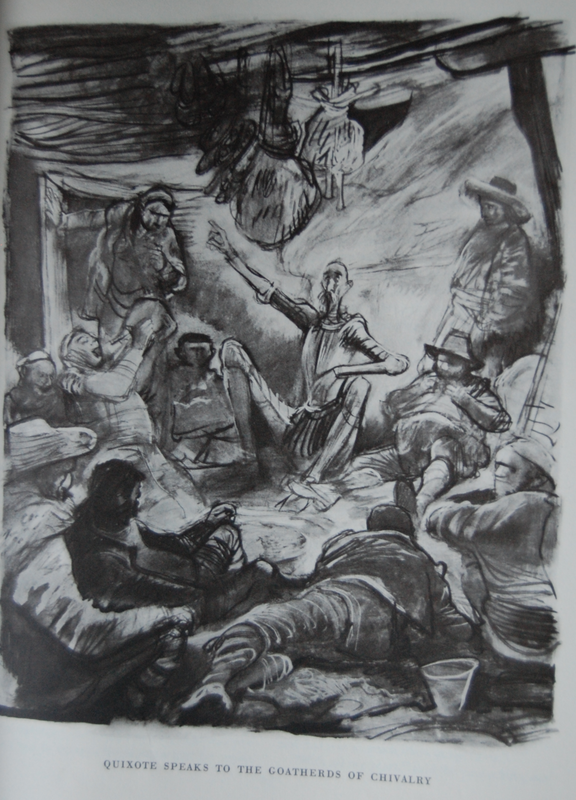 …Professor Lapshin’s illustrations could not be reproduced photographically from the printed reproductions.We decided to shoot the works, and had the illustrations redrawn….Luckily, Fritz Kredel entertains a great admiration for those illustrations by Professor Lapshin; and…agreed to push aside some of his own work, and to redraw the Lapshin pictures so that we would have actual drawings from which to make our reproductions. From the samples I’ve seen in your HP, he did an excellent job. 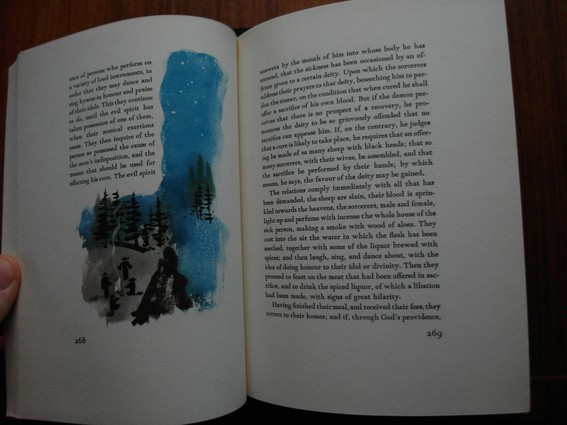 However, the illustrations in the HP seem to be monochrome, albeit in different hues for each illustration, whereas the originals are in multiple, vivid colors for each illustration. They were reproduced originally by offset lithography, and it is some of the finest use of that medium I have ever seen. 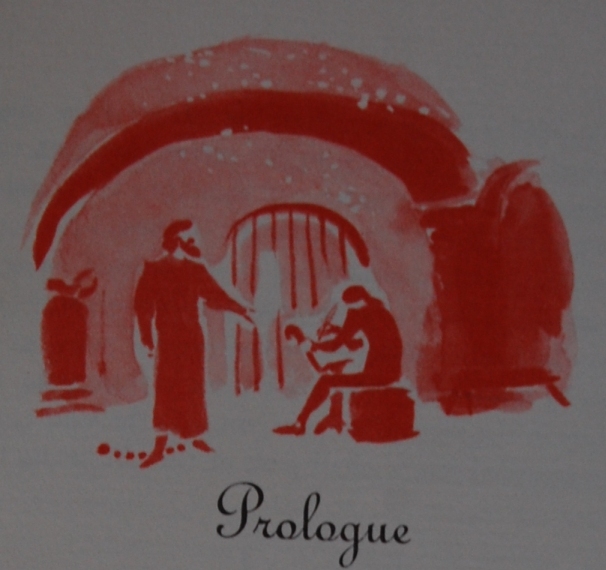 Each illustration actually looks like an original watercolor, and considering how the numerous illustrations are scattered throughout, and integrated with the text, you begin to realize what an astonishing achievement it was for the time (and perhaps the reason Macy cheaped out somewhat on the binding). I’ve included an example of the LEC’s illustrations (courtesy of parchment) in the Examples gallery below. Title Page – Macy chose William Marsden’s translation as his edition’s base, with the revision/editing of that original performed by Manuel Komroff, who further wrote an rather lengthy introduction on Polo’s life and adventures in the Middle East and Asia. 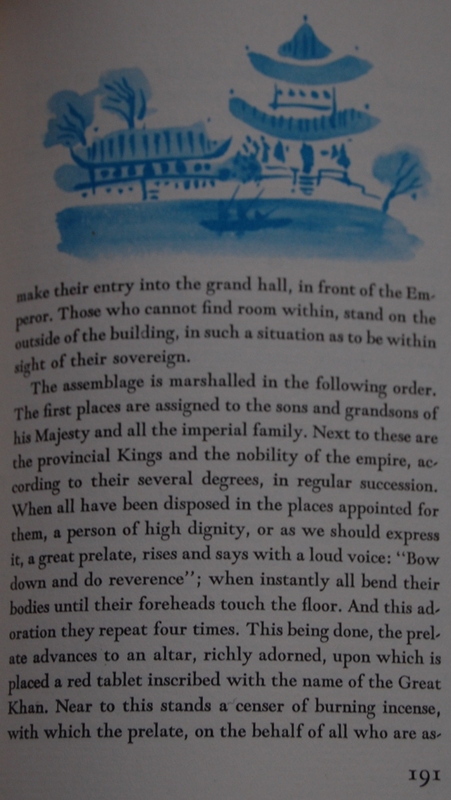 Page 3 – Lapshin’s illustrations are simple (and in Macy’s words, modern for the time), but that simplicity works. These scenes are clearly drawn and superbly executed, despite being, eseentially, redrawings of the originals. Page 173 – Multiple colors were deployed for the drawings: red, blue, brown and green (the latter I have omitted). LEC example – Note the vivid, diverse use of colors here. Personal Notes – I have had this book twice. The first was a lackluster Connecticut issuing I received as part of my 50 book lot a few years ago. 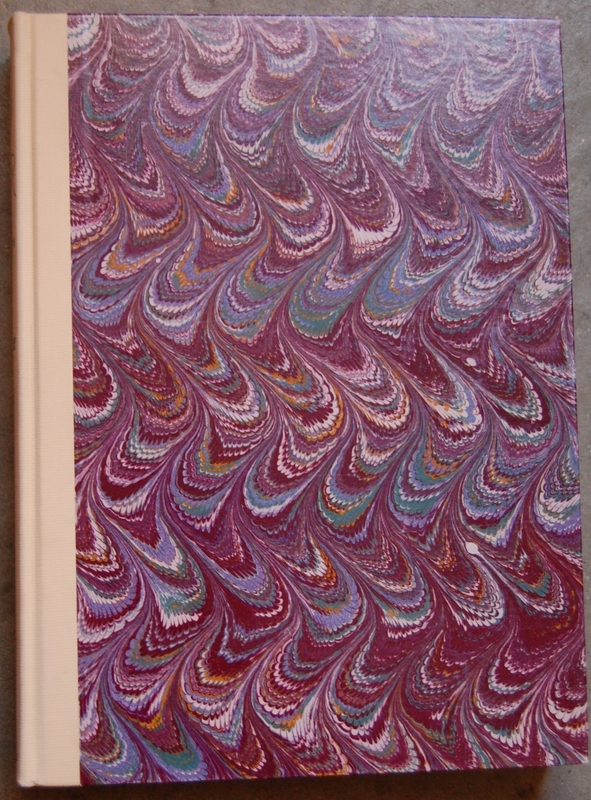 I had seen a nicer edition than that, so I sold it off in the hopes of stumbling upon these earlier, quite beautiful editions. My patience was rewarded earlier this year at Half Price Books, where this amazing edition sat among its shelves for $5. And I was all over it. The LEC illustrations are pretty astounding, but I think I prefer the monochrome ones a bit more (and of course, the binding! ), so I’m in no hurry to replace this. 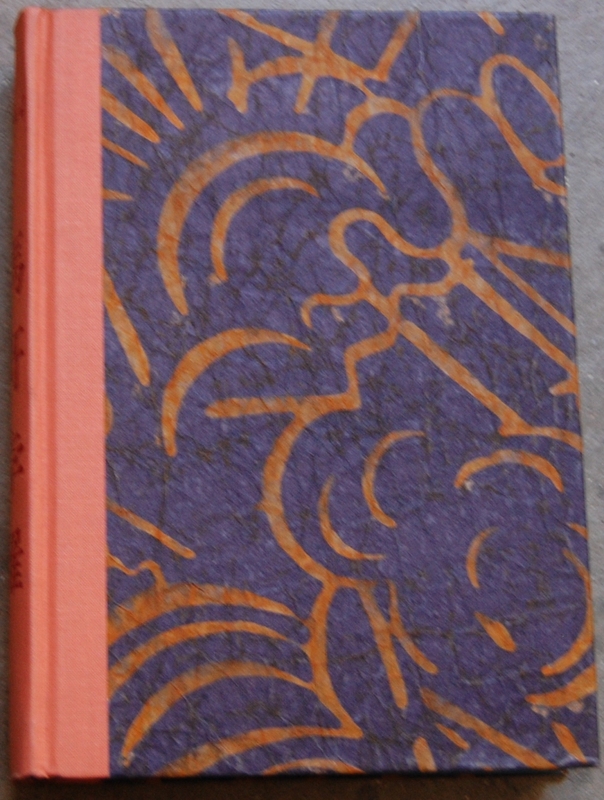 Reprint of LEC #209, 20th Series, V. 1, in 1951 in 2 volumes. 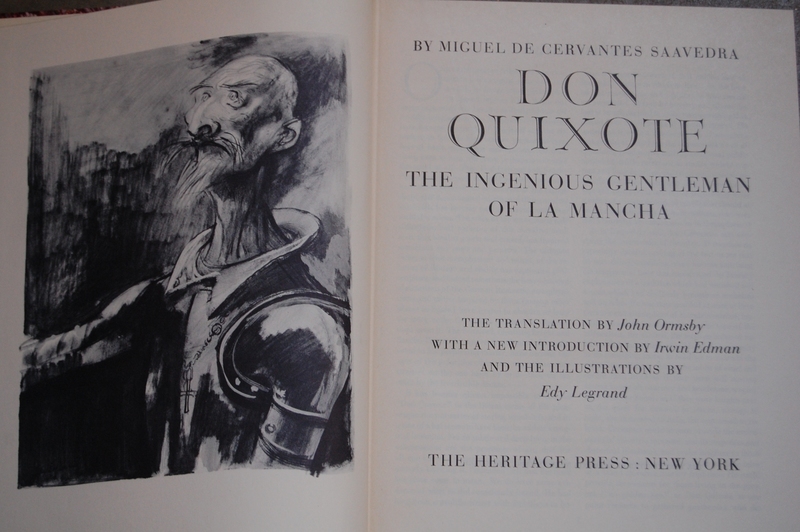 Front Binding – The Spanish classic to end all of their classics, Miguel de Cervantes Saavedra’s Don Quixote, is today’s subject. The Limited Editions Club seemingly liked this work more than many others, as this is the second time the Club dipped into that well. The first, LEC exclusive issuing came out early on in the LEC lifespan, 1933. 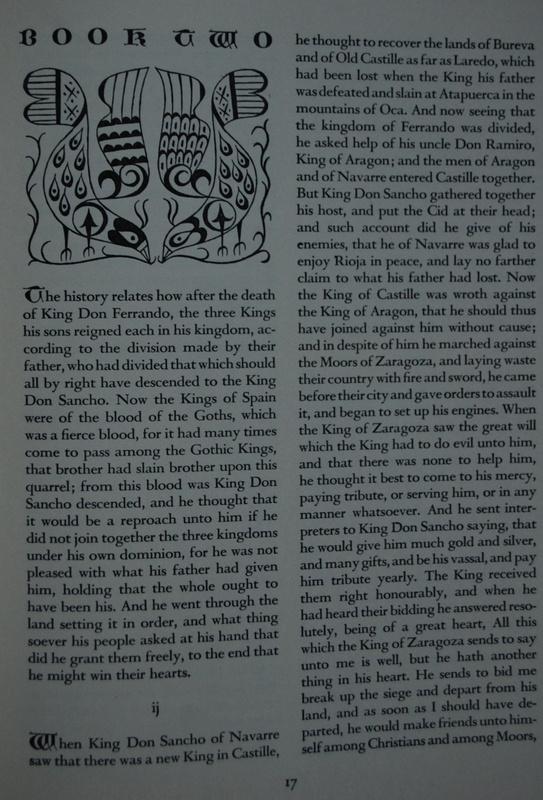 This edition was illustrated by Enric-Cristobal Ricart, and was distributed in two volumes. 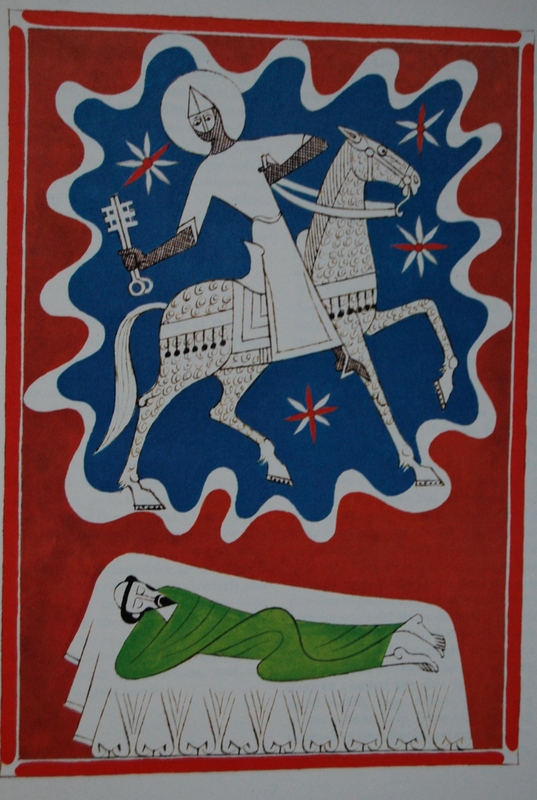 In 1945, long time George Macy Comapny alum Edy Legrand (see The Nibelungenlied for his complete Macy bibliography) expressed his interest in illustrating a second Don Quixote to Macy. Macy relates in the Sandglass that Legrand, although a Frenchman of birth, had adopted Spain as his second nationality, and wished to challenge himself at the proposition of rendering the greatest Spanish literary work. After reviewing some early sketches, Macy agreed, and Legrand went to work, creating 200 individual illustrations as a first draft; his final submission was 48 full page pen/dry brush drawings, five years later. 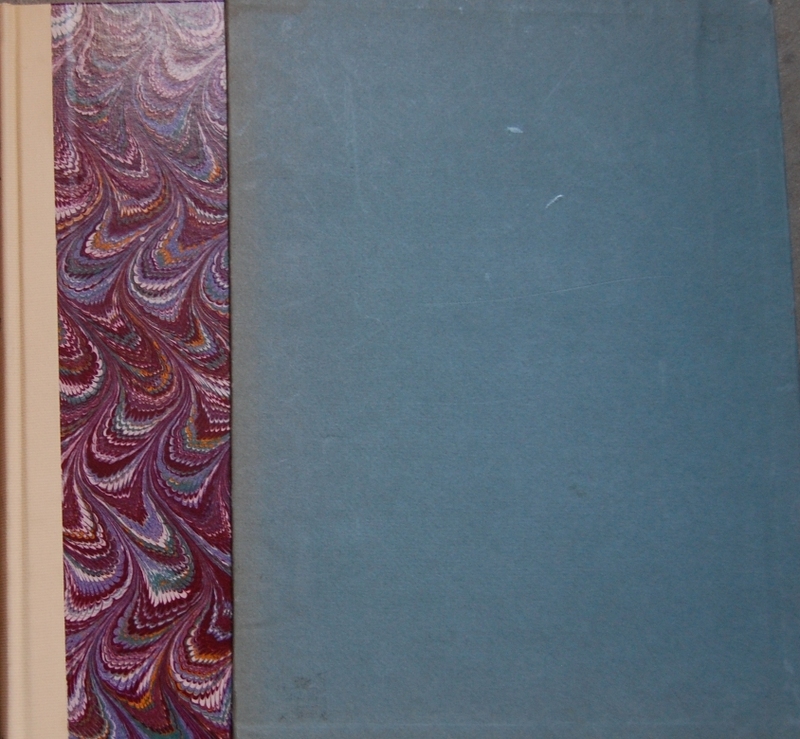 The LEC published their edition in 2 volumes in 1951, which featured colored versions of the art seen here. Cervantes did not receive any other LEC or Heritage offerings. Jerry, it was the selection for November 1951, coming between The Marriage of Cupid and Psyche illustrated by Edmund Dulac and Gray’s Elegy (Agnes Miller Parker). In fact, illustrator-wise this was one heckuva series (Series 16 June 1951 to May 1952). 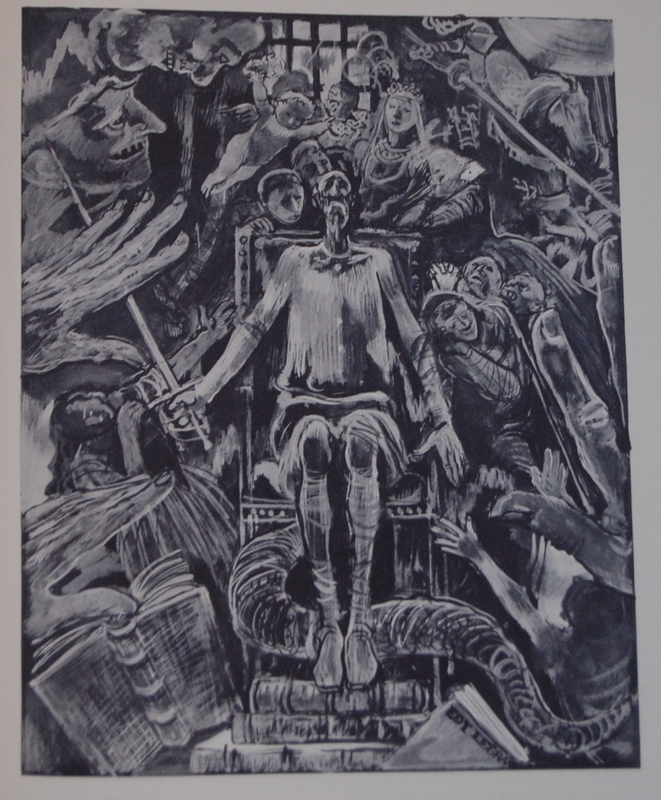 As well as Dulac and AMP it included among others Fritz Eichenberg (Crime & Punishment and the Olivier Henry V*), Hugo Steiner-Prag (Tales of Hoffman), Valenti Angelo (Sonnets from the Portuguese) and Edward A. Wilson (Jekyll and Hyde) – quite an array! As for George Macy saying he read the Rabelais 25 years before, I guess he was just rounding up to a neat figure. As he does in the Quixote Sandglass where he refers to it as a book of “nearly eight hundred pages”. I think it’s actually 682! Never mind the length – it’s the quality that matters! Design Notes – The exact designer of this edition is not stated in the Sandglass. 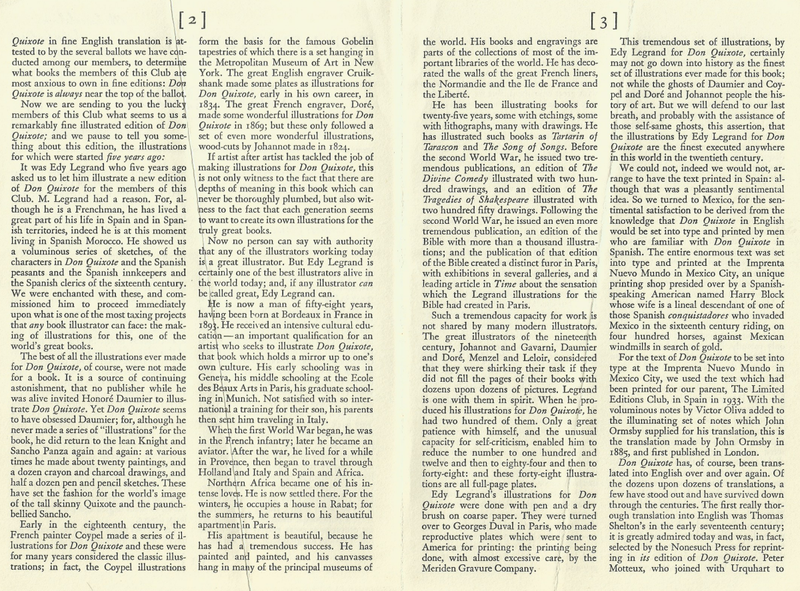 The LEC Monthly Letter for this edition, however, illuminates the likely designer to be Victor Oliva, printer of the original 1933 LEC edition of Quixote. Why do I posit that? Well, Macy says that this book features the “self-same text” from the 1933 edition. Spain was apparently not an option for this edition, which is a bit of a shame (the 1933 edition was, FYI), but Macy felt Mexico was a solid alternative. The text selection was Bodoni, decorated with custom initials. This was originally set and printed at the Imprenta Nuevo Mundo for the LEC issuing, and the Heritage copyright page states that it was done there as well. Legrand’s artwork was reproduced by Paris’ Georges Duval, who then sent the prints to the Meriden Gravure Company for the Heritage run. The binding is also an international affair — bright yellow cloth from England, marbled papers for the boards from France. The bindery is absent here, alas, but the LEC was done by the standards at Russell-Rutter; it’s safe to suppose they had their hands in this edition, too. 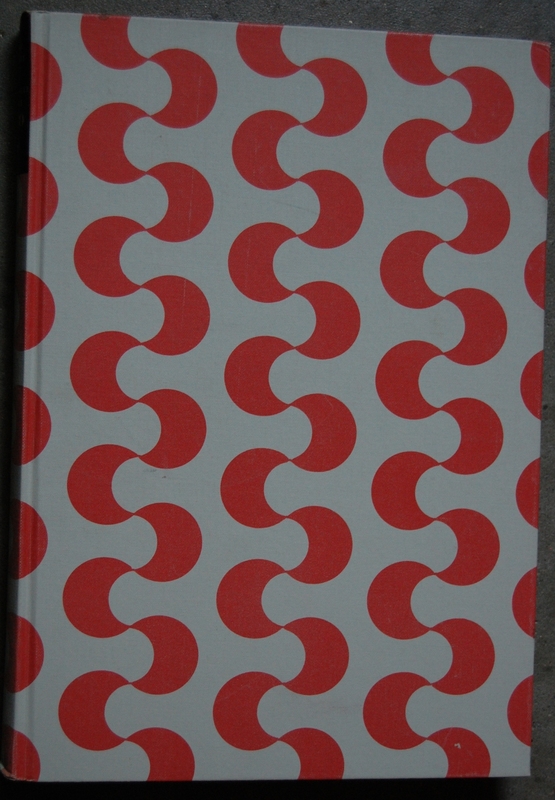 Slipcase – The paper for this slipcase from Italy. Title Page – Irwin Edman wrote up a short introduction, with John Ormsby serving as both translator and preface writer. 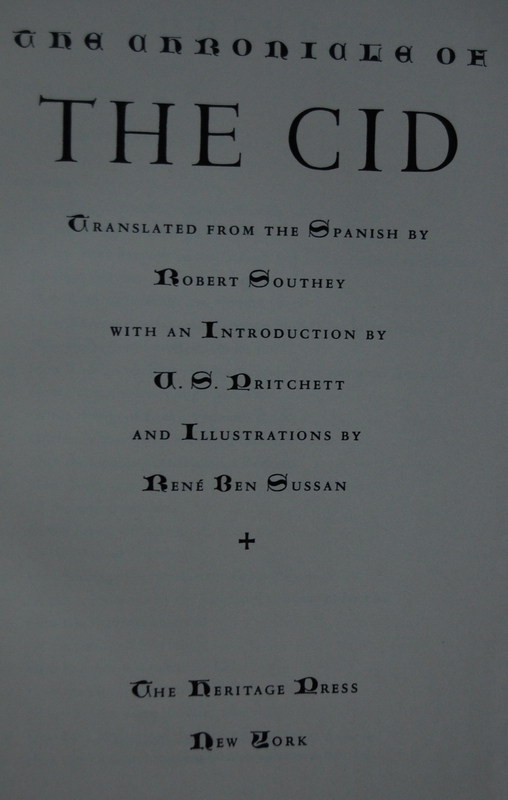 He did his translation in 1885, but the Club felt his was the most scholarly choice for their readers. 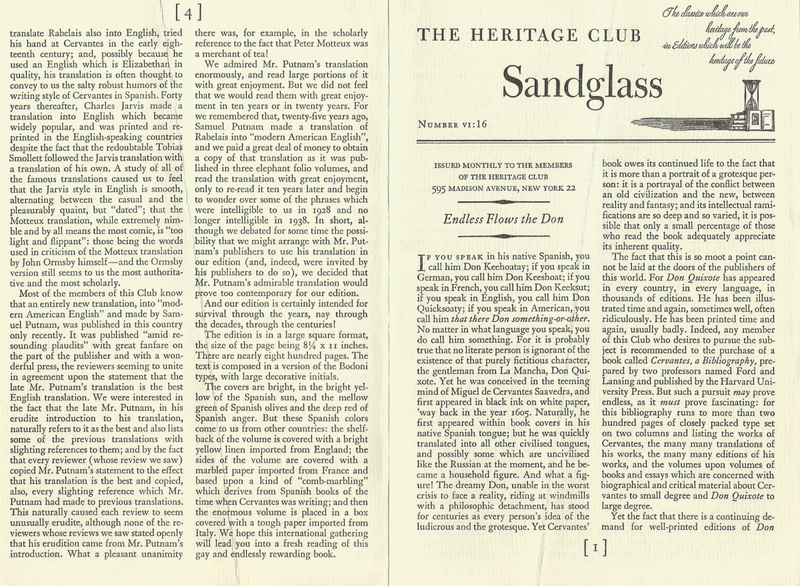 There’s quite a bit of talk about Samuel Putnam in the Sandglass, whose translation of Quixote was just released (and its publishers urged Macy to consider it for his second LEC edition! ), but the ultimate decision was to pass on it due to an earlier transaction with Putnam. In 1928, Macy acquired a three volume work of Rabelais that Putnam translated, and found that the work did not hold up a decade later. Thus, the decision to go with Ormsby. Victor Oliva contributed additional notes. Page 20 – Legrand’s style has a lovely sense of chaotic wonder to it. I quite like it. 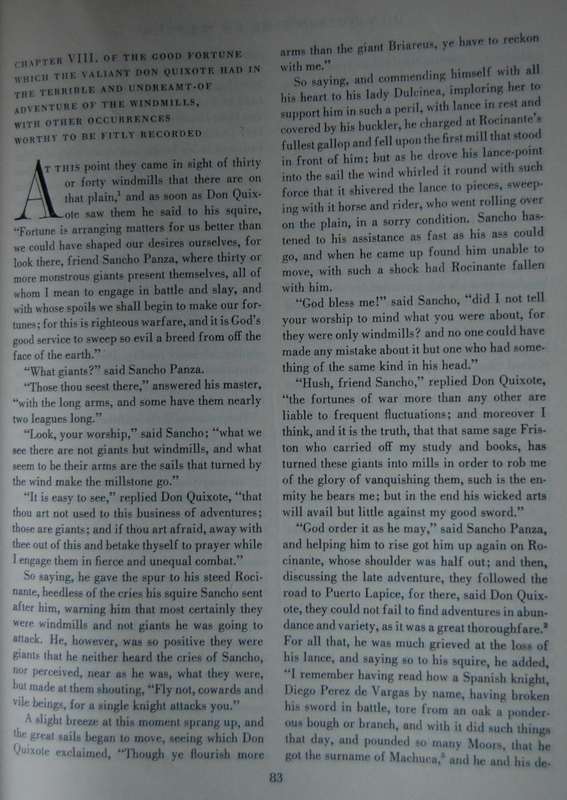 Personal Notes – I’ve spent YEARS looking for a good copy of Quixote. I’ve not had the greatest luck, as the two copies I saw before this one were in horrendous condition and curiously overpriced. Luckily, I came across this one last year in Dublin, CA at Half Price Books, which was complete and in very good condition save a prior owner’s nom de plume on the front endpaper. The price was right at about $10, too, so I snagged it and am happy to finally have my own copy! I’ll have to read it some day! * = featherwate made a slight error here; Fritz Kredel was the illustrator of Henry V, not Fritz Eichenberg. It happens! You are currently viewing the archives for November, 2014 at The George Macy Imagery.